It is a mini-series of articles, blog posts and videos full of herbs, nutritional tips and other holistic approaches to natural dog health care, all sorted out by and following the different seasons of the year. Why? Because by following the natural order, the vegetation time of herbs, and also the Five Element Theory from Traditional Chinese (Veterinary) Medicine, we are able to achieve much better results in supporting our animals´ (and our own) health and do it in a truly holistic way! 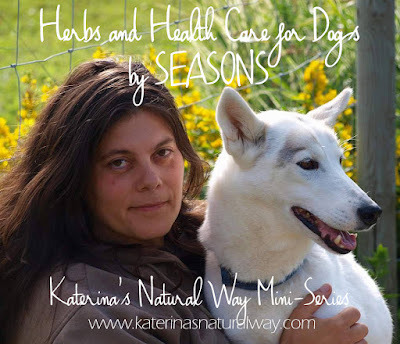 You will have a chance to learn not only about the medicinal properties and nutritional values of for example herbs that grow in spring time, but also about herbs that help support your animal´s organ systems that are under the most influence during this particular season/element. I will also share with you some tips what to focus on during given season, and some important aspects of specific health care in that time. For example, how to keep your dogs warm in winter months from the inside out, or how to keep them cool in the summer heat. But that´s not all! What if I told you that you could efficiently support your dog´s health during various seasons with massage and acupressure? I am super excited to share with you that this mini series is going to include also tips on canine massage and acupressure from a professional small animal acupressure practitioner and canine massage therapist, board member of The Swedish Association for Dog Massage Professionals - my friend Erica Friebel. Erica has agreed to contribute her broad knowledge to this mini series and I can´t wait to share it with you guys! I have dedicated a special page for this series, where all articles, blog posts and videos will be listed in form of links, under specific seasons of the year. You can visit the page here. But now, onto the very first post, which is a mutual work, co-authored by Erica and me. Don´t forget to let us know how you enjoyed it!